This buzzard was found locally lying on the ground in a bit of a poor state after being mobbed by crows. Birds that breed in colonies like crows and gulls are widely seen to attack intruders, especially when their young and territory are threatened by the arrival of a larger bird. This includes flying about the intruder, dive bombing, loud squawking and defecating on them. Although suffering with possible nerve damage to his leg, fortunately an x-ray showed no breaks with the buzzard we received. 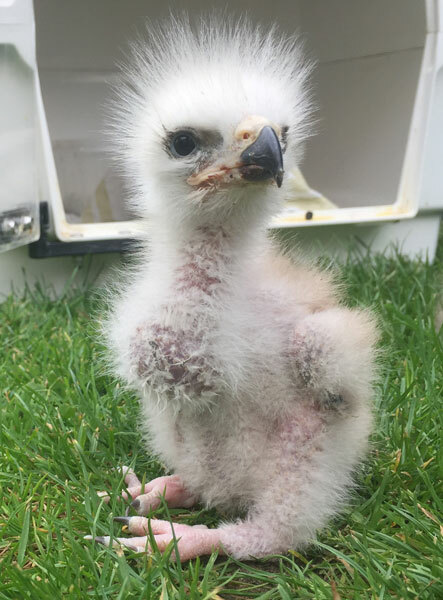 Over the next few weeks, we hope that with some gentle physiotherapy, the leg will regain its movement and he can begin to build fitness again in one of the re-hab aviaries in our new raptor hospital. 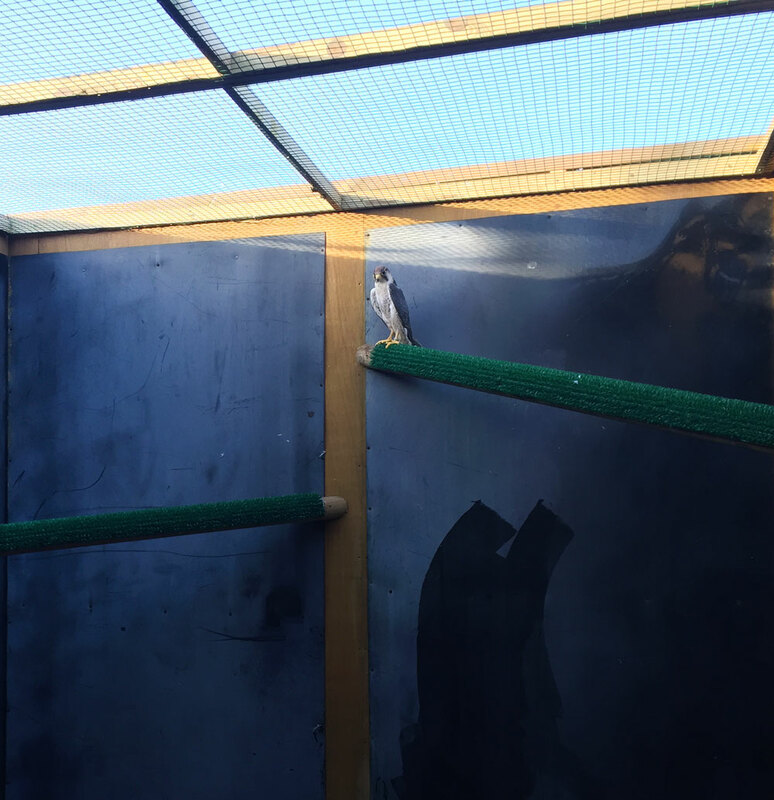 The re-hab aviaries give birds time, space and solitude to recover before they are released back to the wild. This female little owl came in to the hospital after being found on the floor of a barn covered in frost! After being checked out in our hospital there were no obvious signs of anything major being wrong other than malnutrition (the poor little mite was starving) and weakness. Avian casualties continue to be admitted to the Suffolk Owl Sanctuary raptor hospital throughout the winter months. About a week ago, a beautiful mature barn owl was received into the facility having been referred from a local veterinary practice. 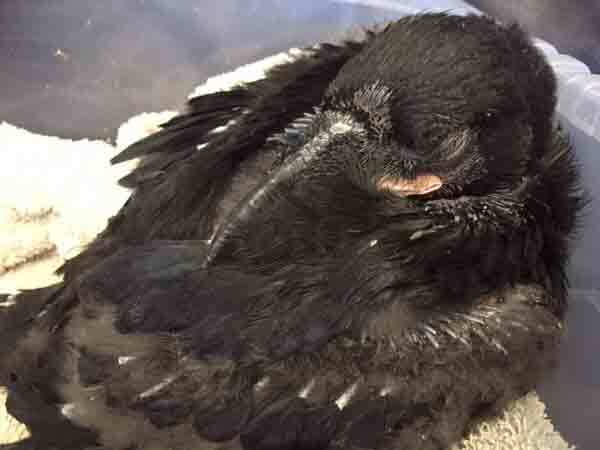 The bird had suffered a blow to the head as the result of a road traffic accident. After careful assessment, the vet was happy to report that the casualty had suffered only superficial bruising and in all other respects was a healthy bird with a great chance of full recovery. This is not a foregone conclusion with any wild bird as the stress involved in being gathered up, boxed and examined can have fatal consequences in some instances. This particular barn owl appeared robust and of good condition, however, and not too obviously distressed by it’s close encounter with humans. On arrival at the sanctuary’s hospital the owl was settled into the rehabilitation aviaries where he was able to gather strength and exercise muscles in preparation for release back into the wild. Over the following week, it has proved to be a model patient, enjoying regular feeds and protection from predators, giving the bruising to his head chance to subside before facing the elements again. The falconry team were able to release the owl back into its natural habitat after time spent in one of the quiet recuperation aviaries where it gained flight strength and was soon released, close to where it was originally found. Spring is the season when the Suffolk Owl Sanctuary’s falconers are engaged in checking the condition of nest boxes and aviary accommodation which has afforded protection to members of our resident bird team from the elements throughout the harsh winter weather. These are the birds variously used in displays, talks and school visits to inform the public about the diversity of owl and other bird of prey species and illustrate the differences, habits, habitats and conservation statuses of the various species. Many boxes will need to be replaced to ensure effective protection is always available to the birds - some may just need augmentation with additional nesting material, to encourage some of the owls and other birds of prey to breed in the coming months. Should progeny result during the season, these are usually exchanged between zoos and establishments similar to our own in order to the maintain breeding bloodlines. 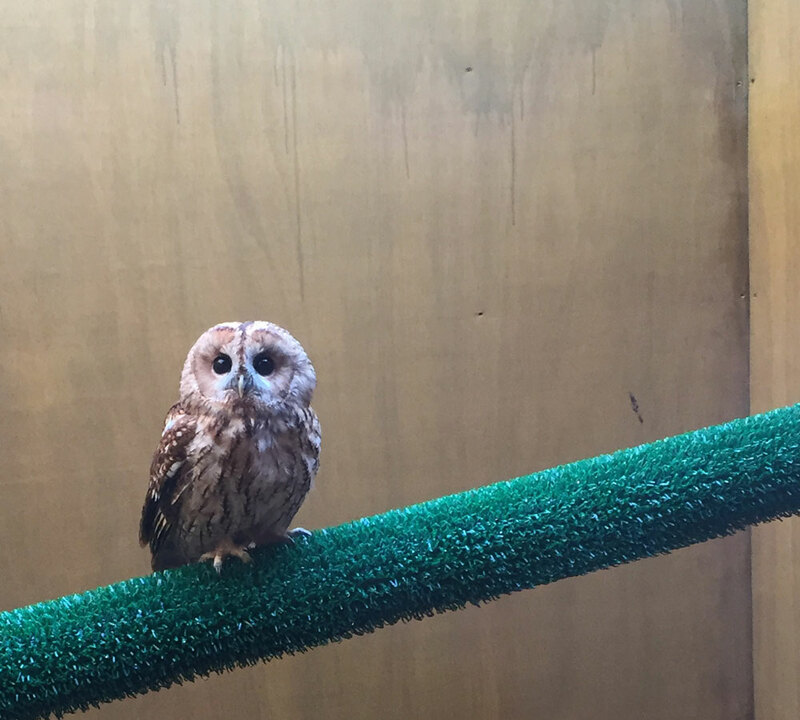 Last week it was the turn of Bumble and Bea, the Ural owls to receive an upgrade to their facilities. A new, spacious nest box was built by the falconers and erected in their aviary and Bea wasted no time in settling down inside. Close companions for many years, the pair have been known to raise young in the past, so it may transpire that a happy by product of the new nest box might be a successful breeding season for them. Ural owls enjoy a wide distribution worldwide, from Japan and Korea in the east to Scandinavia in the west and throughout Europe and Asia. Their preferred native habitat is open woodland and is more often found in moister areas - so ideally suited to the Suffolk climate. In the wild, the Ural owl seeks out hollow tree trunks and old raptor nests in which to lay between 2 and 4 eggs which are incubated for 27 - 34 days. It is hoped that the warmth, seclusion and security offered by Bumble and Bea’s new nest box may imitate their naturally preferred nest sites to their added contentment! At this time of year many birds are pairing up and getting ready for the imminent breeding season. This year, falconers Rufus and Matt are working closely with potential breeding pairs to ensure they have the optimum environment to display this behaviour! A variety of measures can be taken to make the birds’ surroundings more conducive to breeding, such as the location of their aviary, density of planting within, relative seclusion and size and location of nest box/nest site. Falconer Rufus embellishes the tawny eagle nest site with suitable material. Mara and Sambura, the Tawny Eagles have lived together at the sanctuary for about ten years. In that time their interest in breeding has only progressed as far as some token nest building activity, suggesting that they may not yet be a fully bonded pair. For this reason Rufus and Matt decided to take steps to encourage a closer relationship between the two. Rufus gathered a plentiful supply of material together to build a luxurious, robust eagle nest site and hopefully improve the ambience of their accommodation! Sambura the male tawny eagle inspects the recent renovations! On close inspection, Sambura seems to approve of this innovation and the falconers will watch him and Mara closely to gauge any consequential developments in their behaviour. Tawny owls are fairly frequent visitors to the S.O.S. raptor hospital all year round. Often they are casualties from road traffic accidents; sometimes, during the winter months they are victims of harsh weather; during the breeding season, young “branchers” arrive, having fallen from their nest site. A stunned tawny owl will recover from a traffic collision in the S.O.S. raptor hospital. This week a tawny came to us as a referral from a local veterinary practice. A member of the public had taken the bird in after rescuing it from the side of the road. The owl was wrapped in a towel for the safety of both staff and bird and carefully assessed. 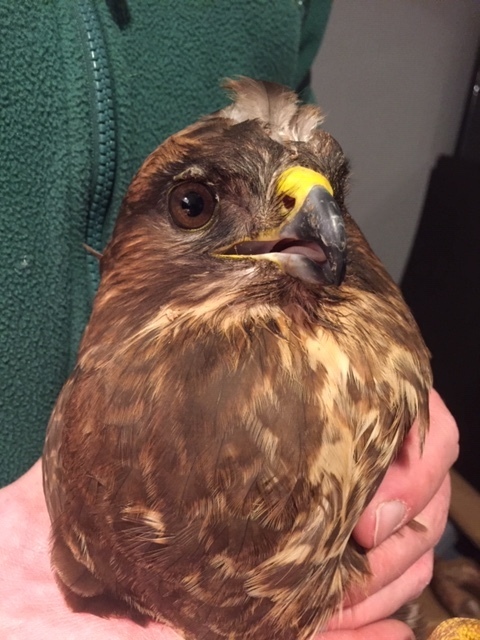 Some bruising was apparent on the head, eye and wing on its right hand side - injuries consistent with a collision with a vehicle. Happily, none of the injuries were serious enough to compromise the bird in any way, so a period of rest in a secure environment, away from predators and with regular feeding, was the prescribed treatment. We expect to release this individual, fit and healthy, back to the wild in a week or so. Although tawny owl numbers locally appear to be fairly stable, numbers have declined steadily over the last few years nationally to the point where the birds’ conservation status has recently been elevated from green to amber. As a consequence, the Suffolk Owl Sanctuary has renewed it’s efforts to support and protect this iconic owl through the nationwide distribution of a “Tawny Troubles” leaflet explaining the plight of the tawny owl population with reference to what is being done to help reverse the trend. The BTO (British Trust for Ornithology) is currently undertaking a survey to investigate the demise of tawny owls more closely. Their programme is designed to bring interested parties into contact with tawny owls, improve their knowledge of the bird’s condition and support the monitoring work undertaken by local groups like Suffolk Owl Sanctuary. Hopefully, this proactive initiative will kick-start long-term projects and ultimately contribute to increasing the breeding success of tawnies. Aside from the rescue and rehab endeavours to return birds fit and flying free back to the wild from instances like the one above, in partnership with the Thornham Owl Project the Suffolk Owl Sanctuary helps to maintain and monitor a network of secure wild owl nest boxes suited to the nesting habits of the tawny owl. Project founder Roger Buxton observes that there is “an urgent need to expand our knowledge of this species so that we are in the best possible position to provide advice on issues that may impact them, whether they are changes in planning policy, alterations to agri-environmental schemes, the management of our woodland estates or climate change. Through the work of the nest box scheme and a variety of educational outreach projects, the Suffolk Owl Sanctuary offers practical support and strives to realise positive outcomes for the local tawny owl population. Tura the Siberian Eagle Owl supervises the allocation of towels donated in response to our appeal on a wet day at the sanctuary! Although S.O.S. fundraising is an ongoing concern and generous donations from the public are gratefully received throughout the year, there are occasions when assistance is required to address specific issues. Most recently, the expansion of our raptor hospital facilities necessitated an increase in stocks of hospital resources. Proper protocols, of course are adhered to for the sourcing of medical supplies, however periphery items can often be acquired through recycling and donation. This was the case when stocks of hospital towels needed replenishing. Towels are essential items within the hospital - they are used to dry birds which have arrived at the hospital saturated and cold and also those which have needed bathing for urgent relief from dirty, oily or sooty plumage. More importantly, they are used for holding casualties safely and securely whilst they are being assessed or whilst medication is administered. A bird's condition can deteriorate rapidly through the stress involved in being handled, so falconers must be able to catch up and hold them tightly, but safely in order that handling time is kept to a minimum. Towels are also ideal for lining hospital night boxes in which casualties can be rested in dark, quiet conditions whilst healing - the soft fabric provides good purchase for talons on weakened or tired legs. The large numbers of baby owls which are admitted to the hospital, having fallen from nests, during the Spring months also enjoy the warmth and comfort of a towel in their brooders! As supplies of hospital towels were getting low, an appeal went out to the public via social media. Within 24 hours local and national newspapers and T.V. news channels had made the story their own! Towels of every size and colour started to pour into the raptor hospital within a couple of days. The generosity of supporters - not just locally but from all over the world - was truly astounding and we would like to take this opportunity to thank EVERYONE for their thoughtful donations, from the U.S.A. to the Netherlands and from Cumbria to the Head Office of Tesco in Bath! Our hospital patients now have a storeroom of dry clean towels to enjoy for many months to come. THANK YOU. Just over two years ago we started raising funds to build a new raptor hospital and suite of recuperation aviaries to receive the increasing number of injured or traumatised wild owls and other birds of prey brought into Suffolk Owl Sanctuary. Thanks to the generosity of our many supporters from across the UK and beyond, and contributions from charitable organisations and local companies, we’re pleased to say that the facility is now ‘open for business’ and thank EVERYBODY who helped us achieve this worthwhile ambition. Click on or near each image for more details. Please donate to the running costs of the hospital. Thank you. Here at S.O.S., injured or traumatised owls and a variety of other birds of prey including falcons, buzzards and kestrels are brought into us for treatment on almost a daily basis. Nearly always the intention to bring it in to us is well meaning but attempts to administer first aid beforehand and the delay this causes can prove fatal - it’s often not appreciated that in order to give each bird the best possible opportunity of life, speed is of the essence. Whenever possible, we strongly recommend bringing the creature to us as soon as you can. The reason is that often the full extent of the problem may not be immediately evident. In the case of the Tawny Owl above suffering damage to the eye, the need for speed is obvious. But in many case the reasons for the incapacity may be hidden. Though the bird may be quiet and still and allow you to handle it, there will be reasons for it: a bird of prey in good health is unlikely to let you get near it. If it is still, the bird may be weak and suffering from malnutrition. It may be dehydrated. The cause of its distress may a hidden injury or symptoms of a debilitating disease. In such cases, resisting the temptation to keep it for a while and maybe try to feed it or apply first aid, may cost the bird its life. Therefore, please make every effort to get the creature into us as soon as you can. Here at Suffolk Owl Sanctuary it will be given expert attention using specialised first aid equipment and critical care formula, will have access to experienced veterinary care and we also keep a good store of TLC on hand to help the bird ‘make it through’ wherever possible. We are on hand to give advice during the waking hours on 03456 807897 Option 5, and we’re open from 8.30am until 4.00pm in winter and 5.00pm in Summer. Put the bird into a well ventilated, darkened cardboard box - not so small that the bird will sustain further damage, but not so large that it can jump around inside. The box should preferably be lined on the bottom with another towel or, if not available, newspaper. Never use straw or sawdust and do not place water in the box. Do not cover the bird with the blanket or towel when it’s in the box for fear of it getting tangled. Do not try to give first aid to the bird - although well-meaning, if incorrectly applied the traumatism of the wrong procedure could hasten the worst outcome. Remember that bird of prey centres and raptor rescue organisations like S.O.S. are there to deal with birds of prey. If you’re not local to us in mid-Suffolk see this list to find one near you. Contact the RSPCA about other types of injured bird, or take it to a vet. Last week we were joined at a special BSL Signing Day for the Deaf by over 200 deaf visitors and their families. Our idea was to bring our flying displays to life for the profoundly hard of hearing who often miss out on the interesting facts & figures given in the commenteries by our falconers during the dramatic demonstrations. Our visitors had travelled from Ipswich, Colchester, Bury St. Edmunds, Lowestoft and West Norfolk for the event and for the majority, this was their first trip to the Suffolk Owl Sanctuary, but hopefully not their last! Groups were met on arrival by our fabulous, highly experienced BSL interpreter, Natalie, who was on hand to offer signing support throughout the day, in all corners of the sanctuary! She did a great job too, not only signing the display commentaries, interpreting the various other activities at S.O.S. and answering a myriad of questions but also in helping our event organiser Catherine reach out to interested groups and societies and encouraging them to come along. Visitors were able to enjoy signed commentaries for two meerkat feeding sessions as well as all three spectacular flying displays . During the latter, a selection of our resident birds thrilled the crowds, flying extremely close and fast. For many visitors, this was the first experience of large owls and other birds of prey flying at such close quarters and will be remembered for many weeks to come. 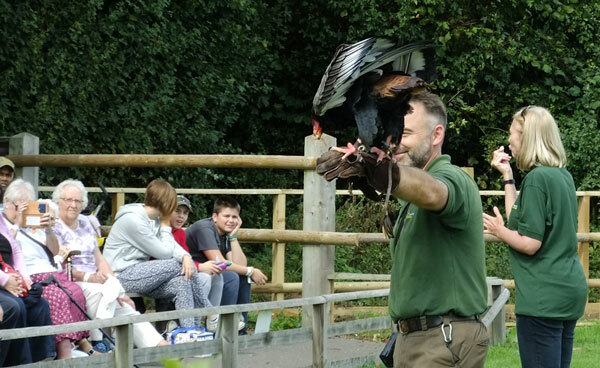 Acting for the centre, falconer Liz provided Natalie with details of the lifestyles, habitats and conservation status of our birds for her signing sessions, whilst falconers Rufus and Steve enabled the birds to demonstrate their aerial dexterity over the flying ground. Magician in residence, Neil, also entertained a rapt audience with tricks, illusions and comical fun as well as painting many young faces throughout the day - all, again with invaluable assistance from Natalie. Finally, Jenny’s Ark Nature Centre also played host to many of the visitors who were able to watch guinea pigs, goats, chinchillas and field mice at play and observe the busy bees at work in the observational bee hive at the new attraction. We hope to offer more fully signed days in the future - watch our website for details and to all our deaf visitors, thanks for coming and we hope you enjoyed your day! Back in May we were really pleased to find that a pair of our Red Kites, Elfin & Bronwyn, had hatched three chicks. This was great news, because the new arrivals will enable us to further illustrate the strong conservational success of a strikingly handsome and instantly recognisable raptor species that has always been the focus of interest in our public displays and school visits. As a result of the persecution of Red Kites dating back to mediaeval times when their scavenging habits incurred the displeasure of the populace, through to their breeding being severely hampered by avaricious Victorian egg-collectors and gamekeepers who saw them as a threat to their livestock, the species was pretty much obliterated. By the early 1900s, Red Kites were thought to be extinct throughout the UK. However, in the late 1980s a colony of 20 Red Kites - thought to be the progeny of just one breeding female - were discovered in Wales. With the plan to re-introduce these beautiful birds back to the UK hampered by the in-bred nature of the discovered group, the R.S.P.B. 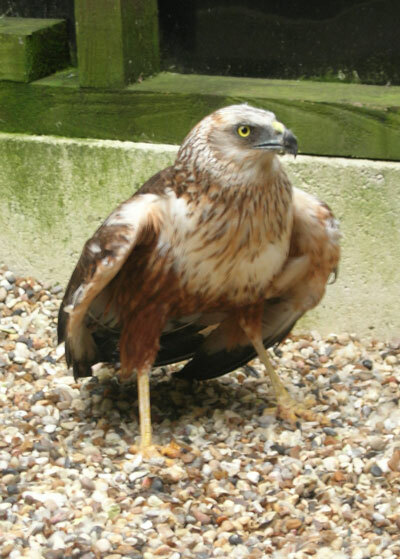 introduced wild kites from Europe to ease the boodline bottleneck and by the 1990s, Red Kites were seen circling the skies along the motorway corridors of Oxfordshire, the Chilterns and East Yorkshire - areas where where the birds had been re-introduced. Nowadays Red Kites can be seen more widely as they have gradually spread further afield. The current population is estimated at around 2000 breeding pairs and pays significant tribute to what has been one of the most successful conservation efforts in the U.K.
Like many birds of prey, the growth of the three young birds that were hatched at Suffolk Owl Sanctuary earlier this year has been rapid, from development as chick to a fully fledged adolescent bird capable of flight. One of the three has been transferred to another bird of prey centre which has education high on its agenda, whilst it’s planned that the two remaining - named Hakin & Elgin - will finish their training and soon take part our flying displays. Notwithstanding, they are perfect examples of why this unique species and its preservation is so important to our bird population, and with such a fascinating history, living proof for our visitors that conservation works! ... and after 3 weeks, this youngster gets its first feel of grass. ... and a week later the birds getting bigger and feathers begin to form. 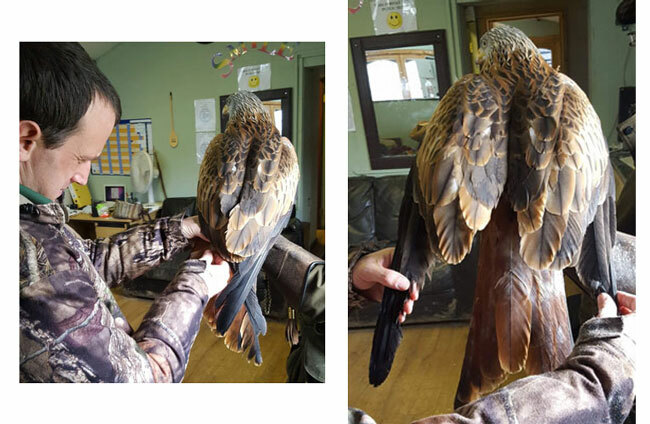 At 8 weeks the form of this adolescent Red Kite is almost complete, ready to join our team as we let our visitors know what what a successful conservation story lies behind this once almost extinct species. Early summer is generally an extremely busy time for the Suffolk Owl Sanctuary’s raptor hospital. This is the season when baby owls and other birds of prey which have fallen from nests swell the numbers of regular casualties, including chimney falls, road traffic accidents and cases of malnutrition and exposure. rehabilitation aviaries at the centre and then to a hack box in the seclusion of nearby habitat. “Hacking out” is a term used for the gradual release of young birds back into the wild. This is done by establishing a protected nest box, which offers free access to a terrain of optimum subsistence. Over several years, the sanctuary has developed a network of private local hack sites, each managed and protected by a guardian landowner. These generous individuals will help our team by spending time feeding and observing the young birds being released until full maturity and strength gives them the confidence to strike out from the hack box and gain full independence. However, the recent prolonged spell of hot, dry weather, has had a marked effect on the numbers of young birds being rehabilitated and then put out to hack. Indeed the weather has had a devastating effect on every tier of the food chain, meaning that even those predators at the top of the chain such as owls and other birds of prey have been compromised. Drought conditions dictate that the small mammal population will be diminished - in turn, other birds and animals dependent on this food source will also experience a reduction in numbers of young. We're currently witnessing that smaller numbers of progeny are being recorded as our volunteer team begin the annual survey of our wild owl nest box scheme. It is hoped that this trend will revert to normal once weather conditions become less extreme. At fifteen years old, Lily the Little Owl is one of the sanctuary’s established matriarchs. Born at Suffolk Owl Sanctuary to Snapdragon in 2002, Lily had lived a mainly solitary existence until quite recently. Despite being introduced to a succession of potential mates over several years, she had refused to tolerate a male presence in her aviary……until Rambo appeared on the scene last year! After a decidedly frosty initial reception from Lily, young Rambo held his nerve and took encouragement from the fact that he had not been completely rejected. By the winter of 2017, Lily appeared to have mellowed a little and as a consequence, Rambo’s confidence grew. After a more intimate relationship was forced upon them by the severe winter weather - and the necessity to share the aviary’s sheltered nestbox - the pair greeted the Spring as a united front. Like all newborns, Sebastian spent a good deal of time sleeping! The depth of their new fondness for each other was then proved in the form of two eggs which suddenly appeared in their quarters. The falconry team could hardly believe that, at this “mature” stage of her life, Lily might have produced offspring! Sadly, one of the eggs proved to be infertile, but the second looked promising and after the allotted 29 days of incubation, a healthy baby little owl appeared. 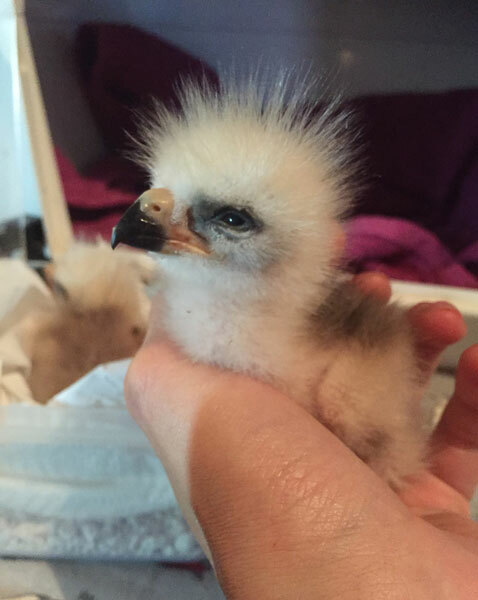 At 6 weeks, Sebastian's handsome adult plumage is starting to appear. In order to protect the little mite from any maternal heavyhandedness, the decision was made to hand-rear him and he quickly settled into a brooder with a cuddly toy in the falconers’ hut! Over the next few weeks little Sebastian grew rapidly and positively thrived in the human environment of the hut - to accustom him to humans from such an early age will condition him for ease of training when the time comes. Seemingly quite at home amongst the detritus of Falconer Liz's desk, at 2 months of age Sebastian seems to have mastered office management! The long-term hope is that Sebastian will in time become a fully fledged (!) member of our flying team, contributing to the enjoyment and education of visitors and school groups and becoming a firm favourite with all the sanctuary’s supporters. As most of us will have experieneced, the last few weeks of exceptionally warm weather have proved slightly uncomfortable for humans, including those working at the Suffolk Owl Sanctuary! The owls and other birds of prey, however, seem to take the soaring temperatures in their stride. Some of the species resident at the sanctuary are particularly well equipped for dealing with heat, for example, Pungu the Bateleur Eagle and Vera the Hooded Vulture, both native to the African continent. Hoever, all birds are equipped with the physiology to regulate temperature, whether cold or hotter weather conditions prevail. Even the snowy and great grey owls from the coldest climes are superbly adaptable to diversity of temperature. Like all birds they have a naturally higher body temperature than humans and many other creatures, and on very hot days they bring into play several additional behaviours to help them keep cool. Visitors to the sanctuary may notice some of the birds standing with open beaks to assist with cooling. Birds do not have sweat glands like humans, so cannot perspire to regulate temperature, neither can they pant like dogs, so opening the beak wide and breathing more rapidly is a quick way to increase air flow around the body. Rapid breaths move hot air across the moist surfaces of the lungs throat and mouth - this moisture then evaporates, expelling hot air from the body. Spreading and puffing feathers also helps to reduce body temperature by allowing air to circulate close to the skin. Birds will also be seen holding their wings away from their bodies to help to lower temperature. The bare skin patches on the legs, feet and faces of most birds allow greater heat loss that the feathered areas of the body; even a fleshy eye ring can help to dissipate heat. Some birds can swell such fleshy patches to increase their surface area if it is necessary to cool off quickly. During the centre’s public flying displays, some birds will also soar at higher altitudes on the hottest days, seeking out the thermals to lift them into higher, cooler air. Water baths are provided for all birds in all weathers at the sanctuary, for preening and cleaning feathers - in the recent hot spell several birds have been standing in their baths to keep their feet cool! As temperatures really peaked in the last couple of weeks, the falconry staff have also augmented the water baths with cooling blocks of ice! As all the sanctuary’s aviaries are naturalistic and species appropriate, they contain a variety of trees, shrubs and plants which offer cool shaded areas for the birds to enjoy. Visitors may rest assured, however, that the centre’s landscaped public gardens also offer plenty of respite from the sun and ice creams and cold drinks are available on demand in the gift shop! The Suffolk Owl Sanctuary Raptor Hospital is always busy in the Spring - casualty numbers being augmented by foundling babies which have fallen from nests or been separated from parent birds. These are generally Barn Owls, Tawny Owls and, less frequently, Little Owls. Recently, however, a Long Eared Owl made a rare appearance in the hospital treatment room, having been brought in from Felixstowe by a member of the public. The incidence of Long Eared Owl patients in the hospital is probably less than one each year, so it was highly unusual ( but interesting) for the falconry team to be assessing such a patient. The owl had been found caught in netting within a warehouse at Felixstowe docks. Luckily, it was within the reach of some of the dockyard workers, who were able to collect it up into a box and transport it to the owl sanctuary’s hospital. On arrival the mature adult owl was assessed and found to have no injuries, although it was, understandably, suffering from shock due to its ordeal. The remedy for the stressful rescue and journey to S.O.S. was merely a few days' peace and quiet in a secluded rehabilitation aviary with regular food and protection from predators. After a week in accommodation akin to a luxury hotel (!) the owl was back in condition and ready to return from whence it came, in the protective custody of its kindhearted rescuer. Long Eared Owls are strictly nocturnal and very well camouflaged within their favoured wooded habitat, so are rarely seen within daylight hours. They also compete for hunting grounds with Tawny Owls, so are rarely seen in areas in which Tawnies are plentiful and this could explain why coastal areas such as Felixstowe may offer favourable habitat. The Long Eared Owl is assessed on arrival and appears alert and active! Crop tubing introduces essential nutrition quickly and effectively. I’ll have a luxury aviary for one, please! Throughout the owl sanctuary breeding season the falconers’ hut at S.O.S. bears more resemblance to a raptor creche than the centre of falconry operations! This is because alongside our wild bird rescue activities, many of the captive bred birds we keep at the Sanctuary used for the flying demonstrations we give to fulfil our educational brief are hatching eggs left, right & centre! Those of the young offspring which our falconers select to use for these demonstrations in future are hand reared so that they become accustomed to - and comfortable with - interaction with humans. The others are reared separately and often exchanged with other centres similar to our own to inject fresh bloodlines into the system. For training to progress satisfactorily, baby birds chosen to form part of the flying team must recognise the falconers as their food source from the time that they hatch from the egg. All the activities that can be witnessed at the sanctuary which involve the owls and other birds of prey working with the falconers are established through this demand for and supply of food. The young birds are weighed every morning to ensure that they are keen enough to look to the falconer to be fed whilst retaining optimum condition. The foundations for this relationship, needs to be established as a priority, as soon as possible. Therefore, after eggs hatch in the incubators, they are moved to a brooder in which the temperature can be precisely controlled and the tiny chicks closely monitored. At this time falconers assume the role of Mum by feeding the pulli often and regularly, with tweezers resembling the parent bird’s beak. Owls and other birds of prey grow extremely quickly due to their high protein diet and within weeks, the young are out of the brooders and strutting confidently around the “creche”. Those birds that move on to new homes at other conservation projects or falconry centres will leave at about 8 - 10 weeks, whilst those that are to remain at the sanctuary can co-habit with the falconers for several more weeks, right up to the advent of serious training, when a permanent home is found for them in the aviaries. It is not only the sanctuary’s own hand reared babies which share the falconers’ accommodation - any baby birds arriving at the sanctuary from other conservation centres to contribute to the educational remit of the centre will also spend their first few weeks getting to know their contemporaries and the staff who care for them within the protective environment of the staff quarters. This year baby raven, Charles has joined the sanctuary’s avian community along with new Mackinders Owl, Nakura. Both have settled effortlessly into their new home and staff hope that on maturity they may form permanent pair bonds with established residents Rey and Kalifi respectively. Nakura, our baby Mackinders Owl gets bigger by the day! In recent months there has been an increase in the numbers of buzzards brought into the owl sanctuary’s raptor hospital. This reflects a general increase in buzzard numbers nationally and within the local area. Found during the worst of the recent squally rainstorms, the mature bird had become completely waterlogged and had gone down in a muddy field, exhausted. Once down in the deep mud, the poor bird became bogged down and the more it struggled to extricate itself from these circumstances, the muddier it became - the weight of the mud finally preventing flight. On happening upon the saturated bird, the landowner realised that it needed assistance - a healthy, fit buzzard would have avoided human contact, however this bird seemed to have been rendered helpless through sheer exhaustion. After being easily gathered up the buzzard was transported to the sanctuary’s hospital and immediately admitted. An initial assessment concluded that the bird had suffered no accident or injury and a warm bath, good food and peace and quiet constituted the prescribed treatment. After a week in the secluded rehabilitation aviaries with a regular food supply and protection from predators, the buzzard was returned to the area in which it was found and released back into it’s native habitat. This was one of many incidents that prove the case for our aspiration to expand and develop our current rather cramped hospital accommodation. Buzzards are large birds which need ample treatment room space and capacious areas for recuperation. To this end, our fundraising drive continues to develop new hospital quarters affording plenty of wing space for the whole spectrum of owls and other birds of prey. 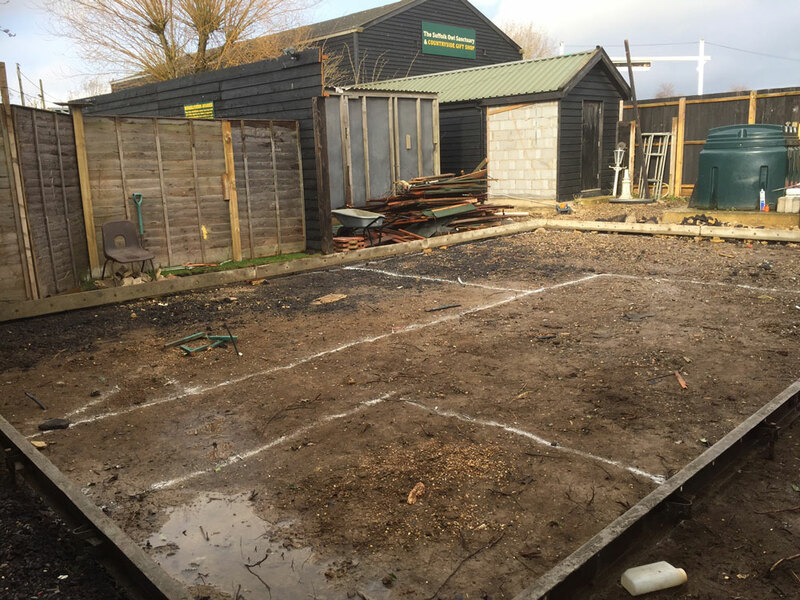 We would like to take this opportunity to thank all our supporters who have generously contributed to this latest project - we have been able to embark on the laying of the new hospital foundations this week! Below: The exhausted and dishevelled buzzard awaits the first stage of his treatment…..a warm bath! When birds of prey damage tail feathers, it can take over a year for them to moult the broken feather out, to allow new growth to take place. In order that birds can get back to efficient free flying more quickly, it is often necessary to “imp” or implant new feathers into the tail or wing affected. Falconers gather feathers for this purpose throughout the moulting season, so that they have a “feather bank” with which to work when necessary. The feathers are kept carefully, clearly labelled and in the correct order, so that they remain undamaged until needed. The attachment of the implanted feathers is a skilled job only undertaken by the most experienced falconers, as the object of the exercise is to replace the damaged feather as quickly and efficiently as possible, in order to avoid stressing the avian recipient for any longer than is necessary. Each feather plays a part in helping birds to glide, dive, weave and turn, so a proper imp job requires careful trimming, measuring and alignment so that the replacement feather matches the original in length and orientation as closely as possible. Basically, the process involves joining the broken feather to its replacement new feather by inserting an “imping needle” (a thin shaft of metal, bamboo, fibreglass or other material) into the shaft of the broken feather. The implanted feathers are held securely in place with a special quick drying glue - once this is dry, there is no outward evidence of this “enhancement” as the feathers all blend seamlessly together. Here Falconer Matt is replacing one of the all important tail feathers of one of our Red Kites, Nessa. Imping is not painful for birds - like human hair or fingernails, feathers are essentially dead matter made of keratin, without sensation. Once the procedure is completed, the bird will be rested for a day or two to ensure that the implanted feathers are remaining securely in place. Imping is an ancient technique, originating hundreds, if not thousands of years ago. The earliest written reference to the practice is thought to be an account from the 1240s by the Holy Roman Emperor Fredrick II of Hohenstaufen, in his revered work, The Art of Falconry. In the Latin work, Frederick explains the necessity for Imponere, to"place upon” or “to fix” feathers and refers to essentially the same process that we use today, though the tools of the trade have evolved. In ancient times imping involved dipping an iron needle in brine to create rust as a bonding agent, rather than a blob of glue! Even Shakespeare was aware of the process - in Richard III, the Earl of Northumberland beseeches his fellow noblemen to “imp out our drooping country’s broken wing” by rebelling against the king. Over the past 18 months, the Suffolk Owl Sanctuary has undertaken it’s biggest fundraising drive to date. The aspiration is to build a new, larger raptor hospital better equipped to deal with the increasing numbers and larger sizes of some of the avian casualties brought into the centre. Most birds enter the hospital via two routes; either our team go out to rescue birds caught in difficult situations like being trapped in a chimney, or they are brought into the hospital by members of the public, often referred to us by local veterinary practices. On arrival at the centre our team are able to assess the severity of the injury or trauma and administer the first aid necessary and frequently-used medication to give the bird some respite before entering rehab. In more serious cases, such as a broken wing or where a bird may have been shot or poisoned, we take the bird to our veterinary who has the expertise necessary to treat the birds’ injuries in surgery or diagnose more specialist medication as may be required. After treatment, the injured bird is returned us as the vet does not have the time and facilities needed for several weeks’ recuperation and rehabilitation. Our current hospital facility has stood us in good stead, but the increase in both the number and physical size of the birds we are called upon to care for has determined the need for larger premises. The fabric of the present hospital facilities was originally very generously donated by Pets At Home in Bury St. Edmunds and equipped with donations from other benefactors. Although hundreds of birds have fortuitously passed through the hospital to be re-released back into their native habitat, still more successful outcomes could be realised with improved and enlarged facilities. 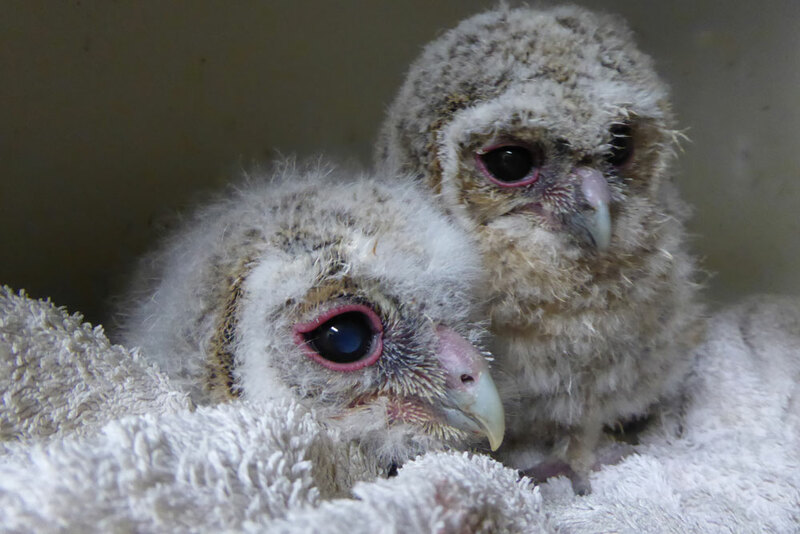 The sanctuary’s hospital is in most demand from May-July when capacity is quickly reached with the springtime influx of baby owls which have fallen from their nests. 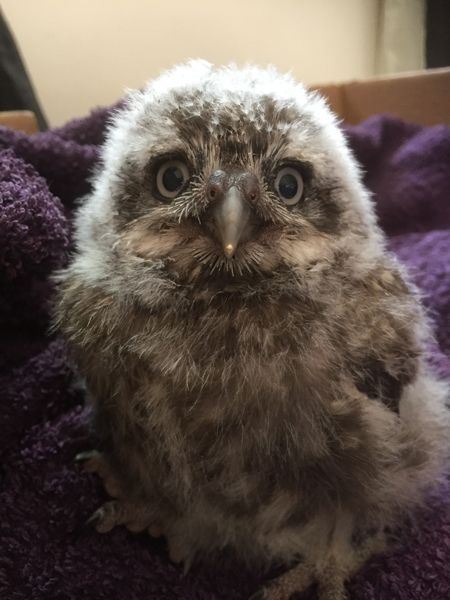 In most cases, these tiny creatures only need plenty of food, warmth and TLC to equip them for life back in the wild and as baby owls grow EXTREMELY quickly, they outgrow their cosy brooders within a few weeks. Plans for the new hospital include a larger incubator room and increased numbers of brooders and nursery accommodation. “Baby season” aside, the normal admissions of adult birds into the hospital due to road traffic accidents, chimney falls, hypothermia and starvation still continue through every season. A bigger treatment room and and larger rehabilitation aviaries are also planned, therefore. 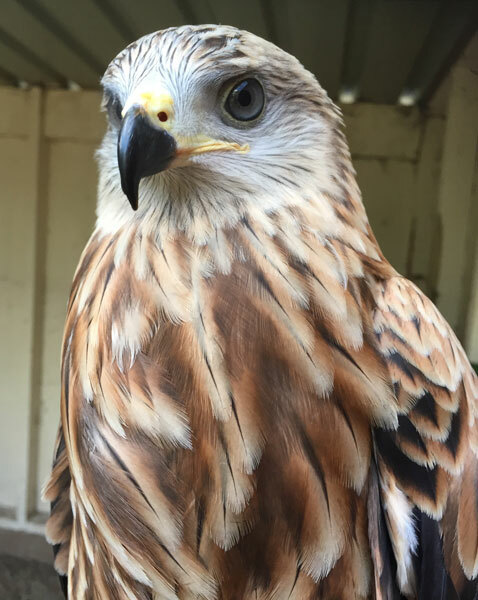 Over the last few months a total of 33 birds have been admitted to the existing raptor hospital with 20 being released back into the wild - a success rate of around 60%. Most casualties were Barn Owls with 11 being admitted. Sadly, due to many of these birds being brought in to us with injuries that had established infections, only 4 could be rehabilitated and returned to the wild. Of 10 Tawny Owls admitted, however, 9 were successfully treated and re-released, with only one road traffic accident proving fatal. 2 Sparrowhawks were brought to the sanctuary suffering from lack of food and after several weeks of recuperation were both released back to their native habitat. 1 Little Owl, 1 Long Eared Owl (a rarity in our hospital) and 1 Buzzard were also successfully returned to the wild after treatment, as were 2 underweight Kestrels. Once quite an unusual sight in our treatment rooms, Buzzard populations are now on the increase in this locality and it is with these birds and the native Red Kite, which is also becoming more prolific, in mind that space will be augmented within the new hospital block. With foundations for the new facilities now prepared and construction of the new hospital set to commence, we look forward to many more successful outcomes for our A & E patients. Meanwhile, we would like to thank everyone who has contributed to funding this huge but much-needed project over the past months - we hope that you will take the opportunity to visit the sanctuary and witness at first hand the essential work carried out in your name in our hospital. THANK YOU.